Ok, as much as I love to camp I have to admit I hate to camp in the winter. The cold and dampness just takes the joy out of the camping experience until now. The Body Furnace has come to the rescue. What is The Body Furnace? Well, it starts off as a body pouch that resembles one of those pouches used to carry your keys, change, and the sort. But inside, this is where the magic begins. Inside this pouch is a wire that is connected to a covered area in the pouch that houses the heat source. This heat source is run by either alkaline AA batteries, which can be one time use or rechargeable. The battery type that can be used is a NIMH pack. 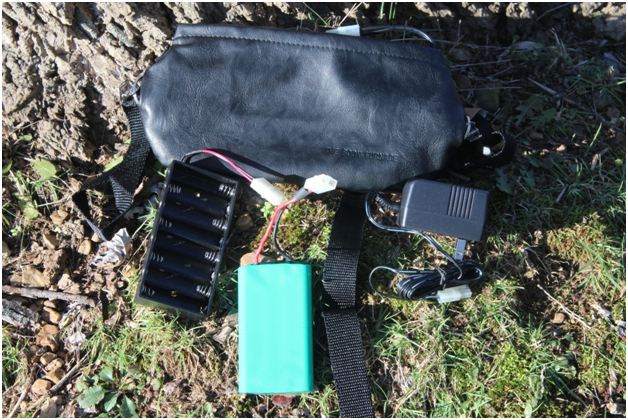 While an AA battery holder does come with the pouch, the recharging unit and the NIMH battery pack and charger are sold separately. To really test this product, I took it on a cold weather camping trip. As part of my preparation, I charged the NIMH battery and took along several AA batteries. I was going to be in an area by which I was not going to be able to charge anything. 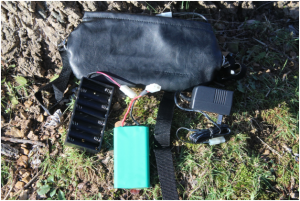 Once I got to camp, I pulled out my body furnace and placed my NIHM battery pack inside. Since I was going to really be moving around I chose to use the belt that came with it. As I began to wrap the belt around myself, I realized how large it really was. Next, I needed to make sure that the warm side was going to be up against me. While I had not turned on the body furnace yet, the warm side was easy to find. It happened to be the side with the extra pouch. Now that I have it on, the next step is to turn it on. Oh yeah, the warmth is coming and I can extend it by what level of warmth I pick. On low, I can expect around 4 hours of comfort. On the other hand, if I choose high then I can get about 2 hours. Boy, this is a wonderful product. The next day, I decided to try the clips that are on each end of the bag. To use these, one must first remove the belt from the bag. Then, you can clip the bag to the inside of your coat, which is what I did. Since there is an on and off switch, it is important to put the switch in a location that is easily reached for heat control. While the coat experience was great, I did have some problems when I tried to use the pouch again as a belt. The belt was hard to get back into the pouch. When it came time to charge the batteries, it was always a guessing game as to whether the batteries were charged. The only way I could test the batteries was to place them in the bag and turn it on. All in all, I would give this product a very big thumbs up. While there are a few issues, they are minor and are worth working around to be able to keep warm and comfortable when I am winter camping.